New – We have moved! We are pleased to announce that Melvyn has teamed up with his son Marc (Scotts of Leeds) and they will now both be trading from new premises at Waterloo Way, Bramley, Leeds, LS13 2EF. The new workshop is now open, photos will be added shortly. We continue to offer the same great value services – Mercedes Benz Servicing, Repairs, MOTs and now with Scotts of Leeds we have over 70 quality used cars on site to choose from. Don’t pay main dealer prices, go direct to Leeds’s long established Independent Mercedes Specialist – call Melvyn now 07711 889 725. We are S E S Auto Sales, formerly Scotts Auto Tec. We are Mercedes Benz specialists – our proprietor Melvyn Scott has over 40 years in the motor trade with 38 of those working on Mercedes Benz vehicles. We can save you money on servicing, repairs and diagnostics – we use the same parts and consumables as the main dealers. Contact us now for a quote, give us a call on 07711 889 725 or use the contact form at the bottom of the page. We offer quality used car sales, we are based in Leeds but we welcome customers from all over the country. With over 40 years in the motor trade repairing cars, we are now selling them as well due to popular demand. Whether you’re looking for a used car or whether you want help with your existing car, give us a call on 07711 889 725 or use the contact form below. We stock a range of quality used cars, contact us for our latest stock list. We can also source used vehicles to your specification and budget. 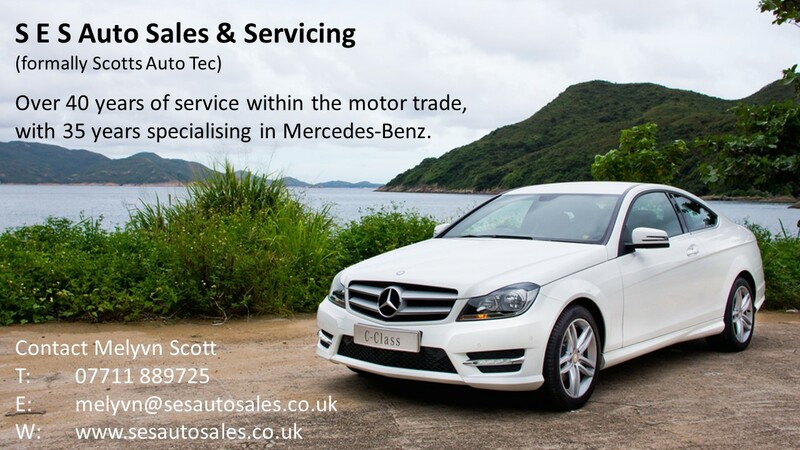 We specialise in Mercedes servicing, also arranging MOT tests as required. We carry out Mercedes repairs old and new but we do love working on the older Mercedes vehicles from the 1980s/1990s. We are based in Leeds, West Yorkshire but we welcome customers from further afield. We can offer repairs/servicing on a mobile basis (subject to availability). Use the form opposite to send us a message. We have just moved – photos of our new premises and workshop to follow. We are at Unit 10, Waterloo Way, Bramley, Leeds, LS13 2EF.